We’ve added a new item type called ‘Assessments’ to Developer Story. 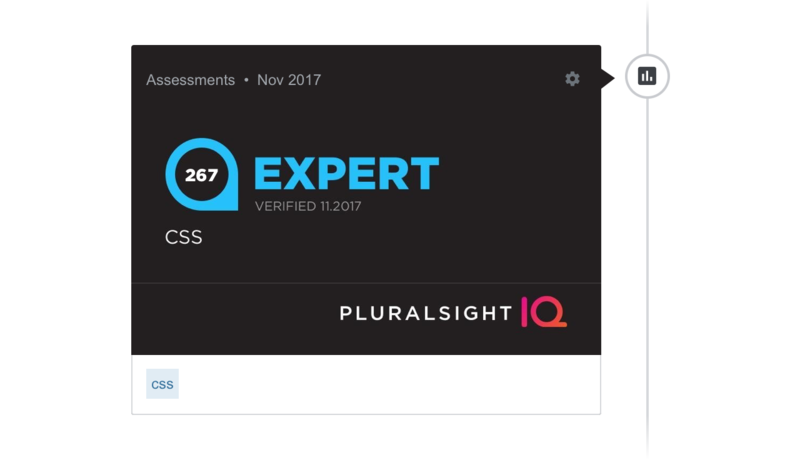 You can take a free skill assessment on Pluralsight and add your Pluralsight Skill IQ to your Developer Story. Developer Story was built to give you a way to show off what you know and what you've built. Incorporating things like open source projects, top questions, and articles or blog posts were designed to help expand your story beyond typical education and work experience. But how do you show language proficiency? While earned reputation can be a good indicator of proficiency, one should be hesitant to draw direct parallels between their reputation and overall language proficiency. Proficiency is just one variable in building reputation. And what about the many developers who have the skills but haven’t been able to publicly demonstrate them for various reasons? 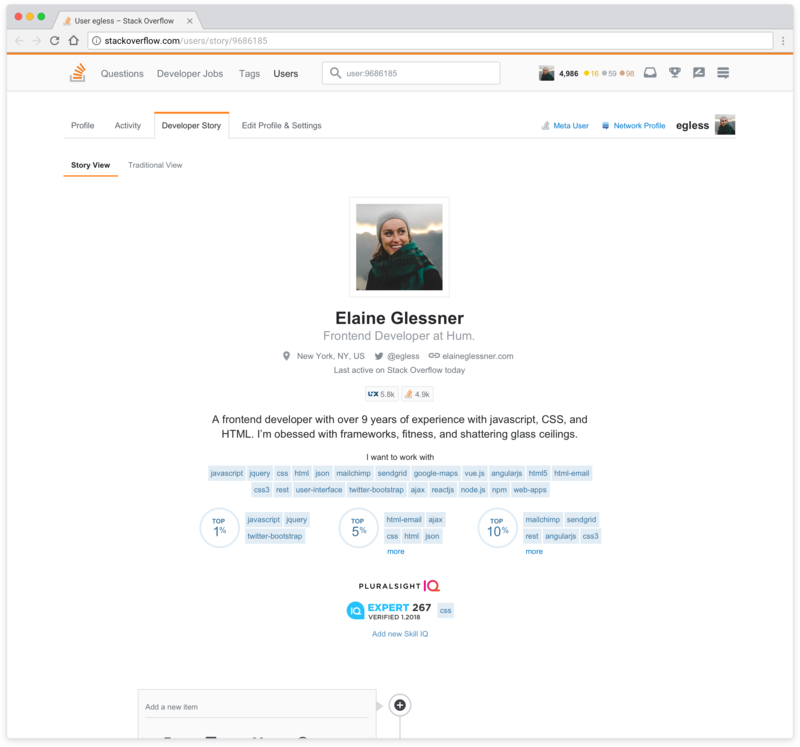 Perhaps the company they work for has proprietary software, making it hard to ask questions or share projects publicly; perhaps they’ve been stuck working without ready access to the Internet. Some folks may simply feel intimidated to jump in the deep end and ask or answer questions. We’ve recognized this issue for a long time and adding new ways to enable people to show off their skills is important to us. 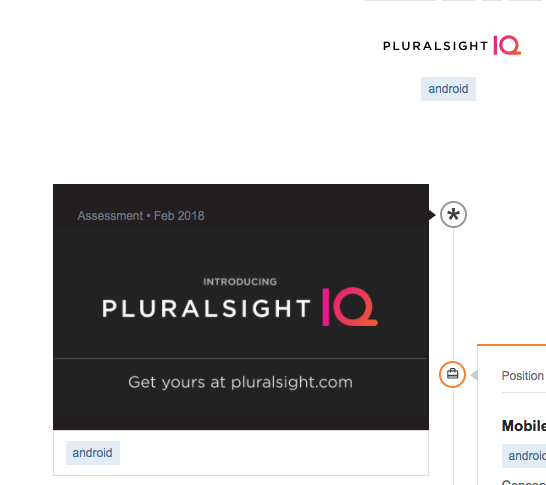 This is why are excited to partner with Pluralsight and their Pluralsight IQ product. Pluralsight's goal to help developers learn and grow in their development knowledge is one that we, at Stack Overflow, enthusiastically support and share. 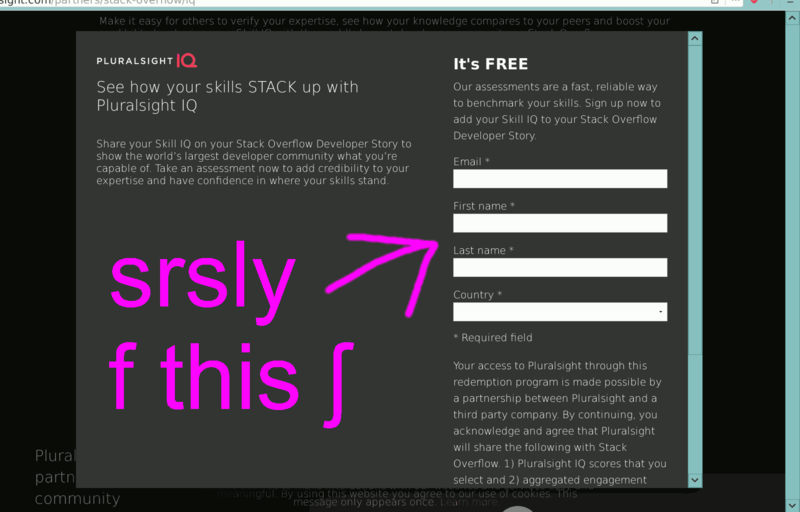 And their new product, Pluralsight IQ, allows each developer to measure their skill level in about 5 minutes. 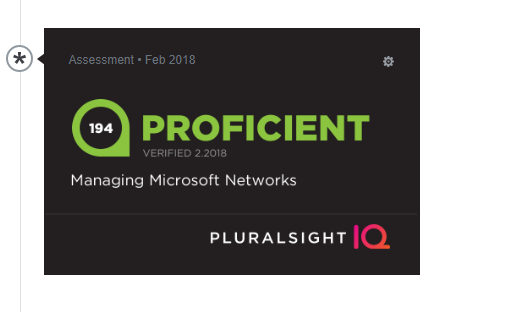 To better understand the technology that powers Pluralsight IQ, check out their blog post about measuring and building tech skills. Starting today, you'll see a new "Assessments" item on the Developer Story. When you click this link, an instructional dialogue will open along with a link. This link will take you to Pluralsight's website, where you will have to log in or create a free account. 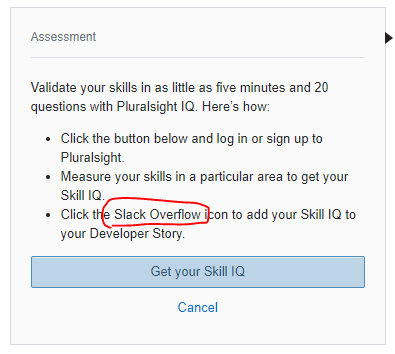 In addition to adding your Skill IQ to your timeline, we'll also add an abbreviated version to the header portion of your Developer Story. Of course you have the ability to remove any Skill IQ from your Developer Story whenever you want. Take an assessment, add it to your story, and let us know what you think! If you find a bug, please report them either by posting them as an answer to this question or by posting questions with the tags bug developer-story pluralsight-iq. For someone who like me struggling with 15 mins to find out the added to SO button in IQ result page. I'm going to put my hands up here and be honest: I cheated. I didn't know the answer to one of the questions, but it had a 20 second timer, and with my relatively fast internet connection I Googled it. I'm not sure how much of a language proficiency test this will be for some people over it being a 'how good at searching for answers are you' test. But I guess being able to search for answers is a skill, right? I'm quite tempted to pick one of the tests which I have absolutely no knowledge in, just to see how quickly I can Google against the clock. I got two answers wrong because I was too hasty, and the answers were one or two characters different from each other. Disclaimer: I have a score of 3 in the mysql tag from 2013. I'm not a MySQL expert; I'm a fraud. another snippet is about "Good Design", which is somewhat subjective. Out of 20 questions, I find 4/5 to be questionable. The other questions, were mostly about syntax or compiler-detectable errors. This is pretty uninteresting, really. I expect a Junior Developer with only a couple years C++ under their belt to do as well as I did on those. I got no question about templates, SFINAE, constexpr, decltype, move semantics, ... in the first attempt even though those are pretty common in C++11 and beyond and a "Proficient" C++ developer would need to know them. And I got no question on the C++ memory model, aliasing, placement new, and other "system-y" parts of the C++ language which distinguish "Proficient" from "Expert". So, yeah, if I open http://coliru.stacked-crooked.com/ in parallel of the assessment and I am fast enough in copy/pasting, I can breeze by all questions on "what does this print". And those are the harder questions. I don't intend of showing off those scores on my account; they were much too easy to attain. Maybe the Beginner/Proficient levels are well calibrated, I wouldn't know, but the Expert one is much too easy by itself... and much too easy to game. I took the C# and Unity tests. A couple of the questions felt really obscure (eg. "When would you use the platform #define directives?") or something I hadn't come across yet (eg. "What is the purpose of the masking part of an animation clip?" or another one about hot keys that I just plain don't use). But I suppose that is what would distinguish an expert user from a beginning user! The "one free retake" is very nice. Used it for the C# test (which I did first, as it was presented up front and I had to dig a little to find the Unity one). There were a few questions that I got wrong and went "oh, duh" (e.g. "which alternative expression would give exactly the same string value?" with the answer of "The code is\r\n3\\48-\"apple\"\\r\\n", I'd been squinting at that answer and another, and had trouble seeing the difference between them: double backslashes vs \r\n. It had sort of turned into symbolic soup under the time pressure). Scored in the 230s for both and added both to my developer profile. Only technical problem I had was that I inadvertently double-clicked at one point and got a question wrong before I'd even read it. Might want to enforce a bit of input delay! The same kind of "prevent clicks" like during the review queues, just to make sure people are actually reading the question. I'm not sure I'd have gotten the question right even if I'd been able to read it, but it was a problem that I didn't get the opportunity. I'm considering taking some others, but I know I'm significantly less skilled in the other skill paths that are currently available. e.g. I could take one of the Photoshop assessments but I actually don't use Photoshop proper, so I'm sure there'd be a question where my response would be "Heck if I know, but I know how to do this in GIMP!" and I'm concerned that a lower score displayed on my developer story would actually hurt me more than help. That is, I don't know if these are going to be viewed as "icing" or "cake." Clearly the intent is for the scoring to be supplementary, but I'm worried that hiring managers are going to boil a profile down into a handful of numbers and say "this guy scored low on some of his skills and displayed them? Skip!" instead of "this guy is an expert in what we need, and is well rounded with a few other skills. Hired!" Take an assessment, add it to your Developer Story, and let us know what you think! OK, here's my feedback. Tell your partner: demanding yet another log-in is a really super annoying thing to do; if you wanna appear clue- and respectful, then treat us well and allow log-in via OpenID. That's why you implemented it in the first place, right? Not sure if I missed a step, but I took the android test and the results are not shown on my storyline. 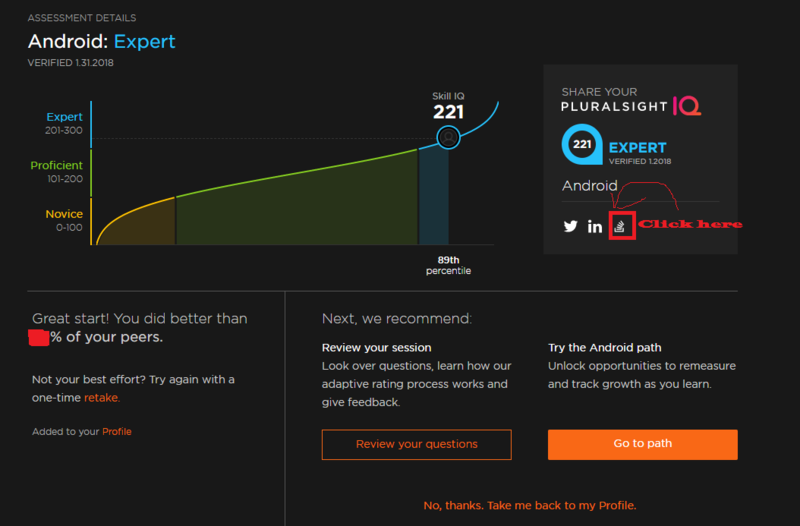 It just shows a generic pluralsight image, and a plain android with no score next to it. I signed up there via the link from the email. Also had some issues where my account was created automatically, but without a password, making me unable to log in. Fixed via password reset. These kinds of tests don't rate your skill or "IQ" in anything, but just check if you've picked up on a bunch of pub-quiz trivia knowledge that is completely irrelevant in the real world. Tried twice. Both times, I had to reload the page several times to go on and a few answers timed out in the meanwhile. A very poor experience. Right now it's not worth to try it. I finished Managing Windows Network test, and added it successfully to my developer story, But it shows no technology tag, also it doesn't appear with other test results on the top of my story. If you're on a classified network, how are you reading this?